This lovely watch is wrapped with pink gold and steel, as well as a rubber strap. Just like you will find in its name, this watch is perfect for outings on the sea. However, it is quite versatile -this watch is waterproof for up to 330 feet and classy for the work place and outings alike. 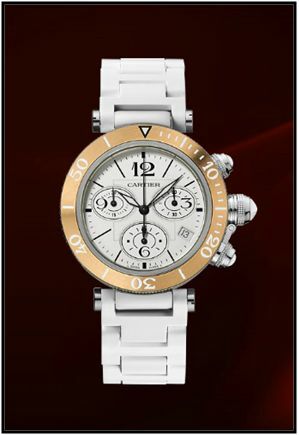 While this watch has regular numbers, its pink gold fixed bezel is engraved with white Arabic numerals. The push-pieces are elegant with a white ceramic ‘clou de Paris” motif, as well as light-up diamond-shaped black oxidized steel hands. The white strap consists of rubber and a deployment buckle that is double-adjustable in steel. Its beautiful sapphire crystal and silvered opaline dial are a common amongst Cartier timepieces. The Pasha Seatimer Lady Medium Women’s Watch W3140004 comes complete with a quartz movement Cartier caliber 7101, as well as a calendar aperture at 4 o’clock. The calendar feature makes everything easier, allowing you to always have a calendar at your convenience –on your wrist.I must say this calendar feature is my favorite part of the watch. Too many times I’m wondering what the date is, and sometimes I can’t find my phone right away -with the date on this watch, I just know it would make anyone’s life easier. The only con I can find is that some women may not like the medium size of this watch. I personally, prefer smaller watches; however, this watch is so stylish, that I don’t mind the slightly larger size. This watch, like all products at Cartier, is shipped to you in a beautiful gift box –which makes this watch a wonderful anniversary gift, birthday present, or mother’s day gift. This particular watch is listed at $6,590. I know this watch is quite expensive, but Cartier is a name you can trust. When you’re getting 18K pink gold in a steel case, sapphire crystal, and all the other features, this watch is worth the hefty price.